Graco Pack n Play Playard with Automatic Folding Feet as one of the best options you will ever find. It excels in terms of ease of use, durability, and superior overall quality, making it a notch higher than other alternatives you can be possibly confronted with. The arrival of a new baby is one thing that most parents are excited about. For sure, if you are an expecting mom or dad, you will be thrilled in preparing the nursery, which will involve buying the essential items that will be needed by your baby. Among others, one that should not be definitely missed is a pack n play, which will provide your baby with a safe place to nap and play. With the abundance of the choices that you will have in the market for pack n plays, which one should you choose? Never make the mistake of deciding in haste, consider a variety of options and take a look at the materials that are used, aesthetics, durability, functionality, and comfort, among other things. From the options that are currently available, one that we can personally recommend is the Graco Pack n Play Playard with Automatic Folding Feet. Made by one of the most trusted brands within the product category, this is one option that you will definitely not regret. Keep on reading to learn more about its features, as well as the good and the bad. We hope that this will help you to come up with a well-informed decision. Considered by many to be an ideal choice for the best pack n play that is available in the market today, it is rich in terms of features that give it an edge above all others. We believe that this is one of the best features of this pack n play. This is a technology that has been exclusively developed by Graco with the intention of designing one that is going to be parent-friendly. With the integration of such innovative feature, taking down the product will be a piece of cake. With this feature, all it takes is a simple push of a button to have it packed. Once the button is pushed, it will break down and fold on its own. With such, it is the perfect choice for parents who are on-the-go. When it comes to versatility, this is also going to be an option that can offer a wide array of benefits. We loved how it is not only a place for babies to play, but also a space where they can take a nap, which makes it a multifunctional addition in the nursery. It has an integrated bassinet, which can handle babies with weight of up to 15 pounds. Another thing that we liked about the Graco Pack n Play Playard with Automatic Folding Feet is its portability. If you live in a large house, you can have it easily transferred from one place to another. There is no need to disassemble the unit to do so. Because it has built-in smooth-rolling wheels, it will be effortless to have it repositioned in the room or house. Another commendable feature of the pack n play is the durable frame. This means that you can be assured that the product will be long-lasting, which is indicative of its ability to provide the best value for your money. Because the frames are designed in a manner that is sturdy, you can also be confident about its safety. Easy to Use: Most parents will definitely like the fact that it is very easy to use. From the time that it is taken out of the box, there will be minimal assembly that is required. Taking it down should never be a problem as well because of the push button system. It also comes with automatic folding feet. Easy to Clean: More than just being easy to use, it must be pointed out as well that this product is also effortless to clean. This makes it a snap to maintain its best quality even in the long-term. Sturdy Body: It is important for the best pack n play to sport a durable body, which is going to be highly indicative of its quality. Aside from being long-lasting, the sturdy body also means that the playard will remain to be stable in spite of the movements of the baby, providing you with the guarantee of safety. 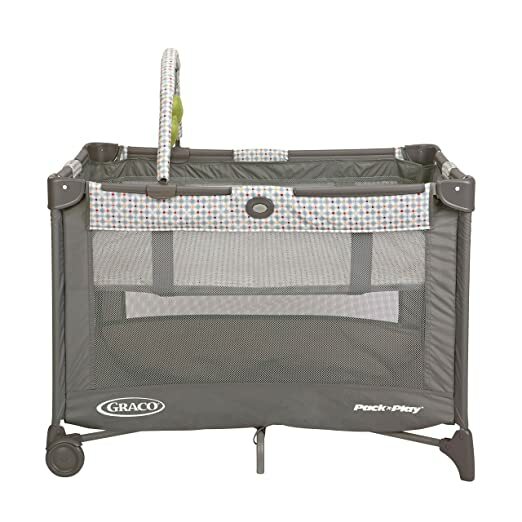 Airy Mesh: One thing that we commend about the design of this pack n play is the use of airy mesh on the side walls. The latter is beneficial because it encourages sufficient airflow inside. This is vital for proper ventilation, which will result into the highest level of comfort. Multifunctional: It is a good thing as well that it has an integrated bassinet, which will provide a space where babies can nap. Easy to Carry: Pack n plays are popular because they are portable. You can easily bring them with you when you travel. In the case of Graco Pack n Play Playard with Automatic Folding Feet, it is a good thing that it comes with a bag that makes it easy to bring it along with you. Comes with a Toy Bar: Your baby will surely be entertained as there is an integrated toy bar. There are three different soft toys that are visually appealing. For sure, babies will be amused every time they see these toys. Plastic Smell: One of the complaints from many people is that the pack n play exhibits a foul odor. This, however, is common for any new product. After a couple of days, you will notice that such smell will go away on its own. Bad Quality Mattress: Many parents wished the quality of the mattress could be improved. It is a bit lumpy, and hence, can be a reason for some babies to experience discomfort. To solve this problem, we suggest buying a separate mattress that is compatible with the pack n play. We believe that it won’t be that expensive. Without a doubt, a pack n play will be an indispensable item in the nursery, given the fact that it can provide babies with a safe and comfortable space. 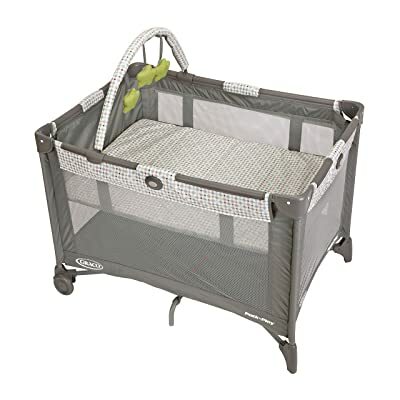 Do not look any further, and instead, consider Graco Pack n Play Playard with Automatic Folding Feet as one of the best options you will ever find. It excels in terms of ease of use, durability, and superior overall quality, making it a notch higher than other alternatives you can be possibly confronted with.